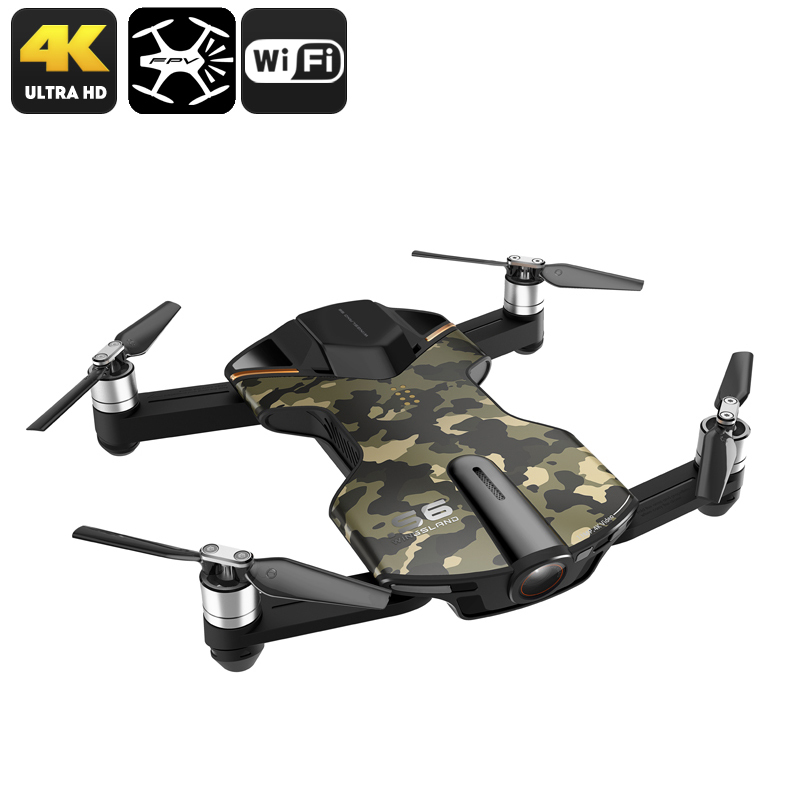 Successfully Added Wingsland S6 Premium Drone - Foldable Design, 4 Flight Modes, 4K Camera, Home Return Key, Wi-Fi, FPV (Camouflage) to your Shopping Cart. Conquer the skies with this camouflaged version of the Wingsland S6 drone. Featuring an ultra-slim and sleek design, this recreational drone is among the thinnest and most compact 4K video drones available on the market. Packing the latest hardware in a device weighting no more than 230 grams, and coming with an abundance of the latest specs and features – this Wingsland drone surely can be considered as the crown jewel of the drone industry. Added to its revolutionary design this quad-copter also features foldable wings, making this amazing drone even more portable. Efficiently carry it around in your bag or pocket without needing to fear about damaging your device, the Wingsland S6 is extremely portable and can be taken along no matter where you’re headed. With its removable 1400mAh batter, this 4K video drone allows you to fly up to 10 minutes straight. Thanks to its intelligent ‘’return to home’’ feature you no longer have to fear about losing power while in mid-air as this smart drone returns automatically to the controller when your battery is nearly of out juice. The Wingsland S6 additionally features an auto take-off and landing option, allowing you to smoothly fly away and put your drone to the ground without needing to worry about damaging your device. Featuring different flight modes, this drone can be easily operated by drone pilots of any level. Whether you’re a beginner or an advanced enthusiast – the Wingsland S6 Drone suits the flying needs and capabilities of everybody out there. Packing an absolutely stunning 4K camera, this quad-copter is capable of shooting mesmerizing footage and images – allowing you to discover your surrounds from an entirely different perspective. Featuring a 1/3-Inch CMOS sensor, this camera is guaranteed to deliver the sharpest and most detailed images imaginable. Along with its 117 degree viewing angle, you can be assured that with this 4K drone nothing will stay uncaptured. Whether it’s 4K video or 13MP photographs, with the Wingsland S6 you’ll be able to capture all your upcoming drone adventures in absolutely mind blowing resolution. Being able to reach up to 100 meters and reaching stunning speeds up to 8m/s, this Quad-Copter is a perfectly capable device with which to explore your neighborhood and shoot some stunning footage of your surroundings. With its Wi-Fi support you’ll be able to share and save your recordings instantly. FPV support additionally allows you to sync your Wingsland drone with your FPV glasses, letting you enjoy a first-hand drone experience as if you were personally flying through the skies. Added to all the amazing features this quad-copter packs, it also offers you the possibility to further upgrade your device by adding external accessories and tools. Why not attach a cool toy mini gun on top of this camouflage drone and sneak up to your friends? Or fly in the dark thanks to a true search light that can be attached to your device? No matter what for you use this cool electronic gadget, with the Wingsland S6 countless hours of fun and entertainment are guaranteed to lay ahead. The Wingsland S6 comes with a 12 months warranty, brought to you by the leader in electronic devices as well as wholesale electronic gadgets..
Arabic: - ك 4 بدون طيار - Chinese Simplified: - 4 K 无人机 - Czech: - 4K Drone - Dutch: - 4K Drone - French: - Drone de 4K - German: - 4K-Drohne - Hebrew: - 4K ט - Hindi: - 4K गबन - Hungarian: - 4K Drone - Italian: - Drone 4K - Japanese: - 4 K ドローン - Korean: - 4 K 무인 항공기 - Malay: - Berdengung 4K - Norwegian Bokmål: - 4K duren - Romanian: - 4K Drone - Russian: - Дрон 4K - Spanish: - Drone de 4K - Thai: - เสียงพึมพำ 4K - Turkish: - 4K uçağı - Vietnamese: - 4K Drone.